Felix Doubront strikes out seven and improves his spring ERA. 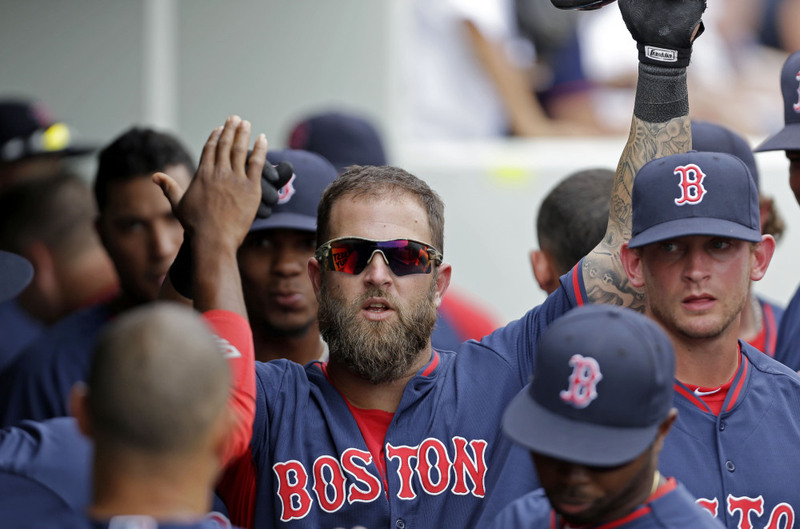 FORT MYERS, Fla. — Mike Napoli hit a solo home run Friday, his fourth of the spring, to help the Boston Red Sox defeat the Minnesota Twins, 4-0. Napoli homered off Twins starter Phil Hughes. The ball landed on the grass-covered berm in left field. Felix Doubront of Boston made the most of his final spring training start, striking out seven and giving up two walks and seven hits in five innings. He lowered his spring ERA from 9.64 to 7.11 in five appearances. Manager John Farrell said he noticed the improvement. Red Sox reserve Mike Carp started at first base, and had two hits with an RBI and two runs. • Ryan Lavarnway and Drake Britton were sent to Triple-A Pawtucket. MARINERS: Cuban rookie Roenis Elias, who had never pitched above Double-A, earned a spot in the starting rotation. TIGERS: Miguel Cabrera will earn a baseball-record $292 million over the next decade under a $248 million, eight-year deal through 2023. • Cabrera had a single in three at-bats as Detroit topped Tampa Bay 6-3 at Lakeland, Fla., in the final Grapefruit League game for both teams. WHITE SOX: Conor Gillaspie had three hits and visiting Chicago beat the Double-A Birmingham Barons, 5-2. PIRATES: Neil Walker had three hits and an RBI to lead Pittsburgh to a 3-0 victory against host Philadelphia. YANKEES: Masahiro Tanaka struck out 10 and allowed three hits over six innings in New York’s 3-0 victory against Miami at Tampa, Fla.
PHILLIES: Cole Hamels was placed on the 15-day disabled list with left biceps tendinitis. DIAMONDBACKS: Reliever David Hernandez has a damaged ligament in his right elbow, an injury that could result in season-ending surgery. BREWERS: Shortstop Jean Segura said his sore right shoulder is feeling better, though it’s unclear whether he’ll will be ready when the season starts next week. • Outfielder Ryan Braun homered and doubled in his first Milwaukee appearance at Miller Park since his doping suspension, coming in a 5-4 loss to Kansas City. CARDINALS: The team closed the deal on the purchase of the Triple-A Memphis Redbirds, its top farm team. BASEBALL PLAYERS suspended during the season for a performance-enhancing drug violation won’t be eligible for that year’s postseason under changes to the sport’s drug agreement. BUD SELIG, the commissioner, said baseball’s revenue could top $9 billion this year. BLUE JAYS: Pinch-hitter Ricardo Nanita singled with two out in the ninth inning to give Toronto a 5-4 victory against the New York Mets at Montreal. ROCKIES: Right-hander Jhoulys Chacin is going to start the season on the 15-day disabled list with a shoulder strain. ANGELS: Outfielder Mike Trout agreed to a six-year contract extension worth $144.5 million through the 2020 season. GIANTS: Right-hander Tim Lincecum left with a left foot injury after he was hit in his back leg by a hard-hit grounder from Daric Barton of Oakland.